The Duchess of Cambridge has proved once again why she’s a firm favourite among the royal family during a fun-filled day in Northern Ireland. 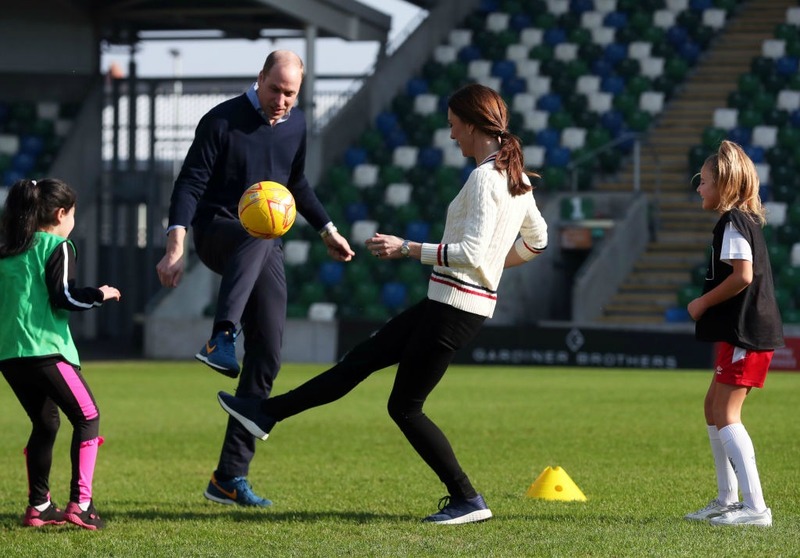 The duchess and her husband Prince William arrived in Belfast on Wednesday as part of a two-day visit to Northern Ireland, and they didn’t waste any time before getting amongst the locals and participating in a bit of sporting action. The couple’s short tour will focus on initiatives to help local children get active and Catherine and William, both known for their love of the outdoors, eagerly rolled up their sleeves for a bit of fun with the kids. Their first stop was the Windsor Park football stadium, home of the Irish Football Association, where the royals played a game of football with children. Catherine in particular appeared to have a ball running around with the kids and wasn’t afraid to have a go at tackling the youngsters and her husband. Photos and videos shared from the event show the royal trying to steal the ball from William at one point before running up the field chasing the kids as they headed towards the goal posts. The duchess proved to be quite the player and managed to hold her own against her football-loving husband. However, while the Catherine may enjoy the game, Nine Honey reports she told some of the children that George is currently learning how to play and doesn’t think much of his mother’s skills, telling her, “Mummy, you’re so rubbish”. “I should have picked up some tips from George,” she joked. Later in the day, the royal couple headed to the Roscor Youth Village, which is run by Irish charity Extern. The residential activity centre is for children referred to the charity by social workers or the Department of Justice, many of whom have difficult family backgrounds. The site provides a safe space to help and support young people, with particular emphasis on outdoor activities and developing independent living skills. William had the children in stitches of laughter as he tried to cross a balance beam with the kids lining up either side of him to catch him if he fell. Meanwhile Catherine tried her hand at archery, although she didn’t seem to fare as well here as she did on the football field, laughing as her arrow quickly lost speed and fell to the ground. The evening’s events proved to be a bit more glamorous, but still just as fun, as the royals ventured to the iconic Empire Music Hall in Belfast city. The couple attended a party celebrating young people who are trying to make a difference in Northern Ireland through their charity work and small businesses. It didn’t take long for the duke and duchess to get the crowd cheering as they both tried their hand at pouring a pint behind the bar. Catherine went first, being careful not to spill anything on her stunning mint green 1970s-style dress, and didn’t fare too badly with a slightly too-thick head of foam at the top of the glass. William’s pour was deemed almost perfect and earned a big round of applause from the crowd watching on. The royals will continue their tour on Thursday, visiting Ballymena north of Belfast to meet more locals and charity organisations working with youth in the country. Are you a fan of this royal couple? Do you think they’re a positive influence on the monarchy?